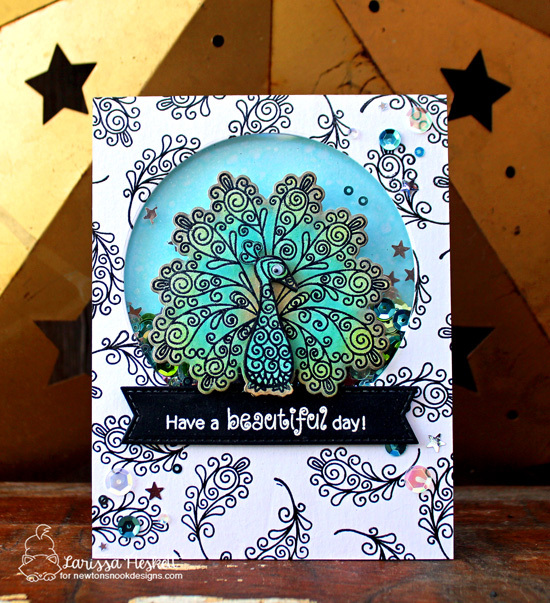 This peackock card by Larissa is so gorgeous! She created this beautiful card using the pretty peacock from our Beautiful Plumage Stamp Set. She stamped the peacock embossed it in black. Then she inked over it with distress oxide inks. This is a fabulous way to add lots of vibrant color without having to spend a lot of time coloring. She did stamp the image and ink it a second time and fussy cut out the bird body and head so she could layer it over the first image to add some dimension! Isn't it cute how she gave it a googly eye? Then created a big circle shaker window card to add this image to. She stamped the single feather repeatedly to create a fun black and white pattern and added some pretty sequins too. Then she finished off the card with the "Have a beautiful Day" Sentiment from the Beautiful Plumage Stamp Set, embossed in white over black! This card is so lovely it would brighten anyone's day!